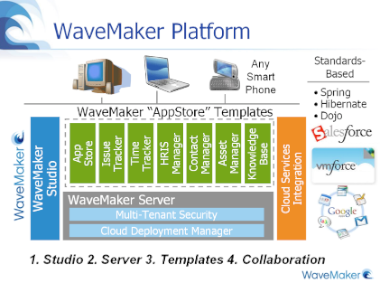 Yesterday at Appirio we had a private demo of the WaveMaker platform from the guys at WaveMaker. I'll try to recap most of the things that I heard as it pertains to Salesforce.com and vmforce but for more details you'll want to check out their website. WaveMaker Studio: a visual, drag & drop development tool that runs in a browser and can be installed on a desktop or accessed via the cloud. The WaveMaker Studio is a pretty slick drag-n-drop interface with live previews of data for bound widgets. You can consume Web Services, database schemas and Java services to automatically generate boilerplate code for you. On the frontend it generates Dojo widgets and Spring and Hibernate components for the backend. It essentially spits out a standard Spring application that will run in any standard J2EE environment. So how does this related to Salesforce.com? They are working for a release in July that supports the Force.com platform and will run on VMforce. They can consume the Enterprise WSDL and generate a standard front and back end components that you can import into Eclipse and start customizing. Their goal is to treat Salesforce just like any other database. However they are trying to build in some platform logic such as governor and limits based up the running edition. These java apps can then be deployed to EC2 and VMforce. If you are interested, there is a free, community edition you can get started with right away. I'm not sure of the pricing for their enterprise or cloud editions so you'll want to check with them if they have a seat and/or runtime license before you invest too much time. Web Fast: with WaveMaker's visual tools, any developer can start building enterprise Java applications with minimal training. CIO Safe: WaveMaker creates standard Java applications, boosting developer productivity and quality without compromising flexibility. Cloud Ready: WaveMaker enables one-click deployment of rich internet applications to on-site or cloud hosting. Reduces code 98%: Migrated .NET app with 26K lines of code to WaveMaker with 335 lines.